The Doge of Venice (/doʊdʒ/; Venetian: Doxe de Venexia [ˈdɔze de veˈnɛsja]; Italian: Doge di Venezia [ˈdɔːdʒe di veˈnɛttsja]; all derived from Latin dūx, "military leader"), sometimes translated as Duke (compare the Italian Duca), was the chief magistrate and leader of the Republic of Venice between 726 and 1797. Doges of Venice were elected for life by the city-state's aristocracy. The doge was neither a duke in the modern sense, nor the equivalent of a hereditary duke. The title "doge" was the title of the senior-most elected official of Venice and Genoa; both cities were republics and elected doges. A doge was referred to variously by the titles "My Lord the Doge" (Monsignor el Doxe), "Most Serene Prince" (Serenissimo Principe), and "His Serenity" (Sua Serenità). The first historical Venetian doge, Ursus, led a revolt against the Byzantine Empire in 726, but was soon recognised as the dux (duke) and hypatos (consul) of Venice by imperial authorities. After Ursus, the Byzantine office of magister militum (stratelates in Greek) was restored for a time until Ursus' son Deusdedit was elected duke in 742. Byzantine administration in Italy collapsed in 751. In the latter half of the eighth century, Mauritius Galba was elected duke and took the title magister militum, consul et imperialis dux Veneciarum provinciae, master of the soldiers, consul and imperial duke of the province of Venetiae. Doge Justinian Partecipacius (d. 829) used the title imperialis hypatus et humilis dux Venetiae, imperial consul and humble duke of Venice. These early titles combined Byzantine honorifics and explicit reference to Venetia's subordinate status. Titles like hypatos, spatharios, protospatharios, protosebastos and protoproedros were granted by the emperor to the recipient for life but were not inherent in the office (ἀξία διὰ βραβείου, axia dia brabeiou), but the title doux belonged to the office (ἀξία διὰ λόγου, axia dia logou). Thus, into the eleventh century the Venetian doges held titles typical of Byzantine rulers in outlying regions, such as Sardinia. As late as 1202, the Doge Enrico Dandolo was styled protosebastos, a title granted by Alexios III. As Byzantine power declined in the region in the late ninth century, reference to Venice as a province disappeared in the titulature of the doges. The simple titles dux Veneticorum (duke of the Venetians) and dux Venetiarum (duke of the Venetias) predominate in the tenth century. The plural reflects the doge's rule of several federated townships and clans. After defeating Croatia and conquering some Dalmatian territory in 1000, Doge Pietro II Orseolo adopted the title dux Dalmatiae, Duke of Dalmatia, or in its fuller form, Veneticorum atque Dalmaticorum dux, Duke of the Venetians and Dalmatians. This title was recognised by the Holy Roman Emperor Henry II in 1002. After a Venetian request, it was confirmed by the Byzantine emperor Alexios I Komnenos in 1082. In a chrysobull dated that year, Alexios granted the Venetian doge the imperial title of protosebastos and recognised him as imperial doux over the Dalmatian theme. The expression Dei gratia (by the grace of God) was adopted consistently by the Venetian chancery only in the course of the eleventh century. An early example, however, can be found in 827–29, during the joint reign of Justinian and his brother John I: per divinam gratiam Veneticorum provinciae duces, by divine grace dukes of the Venetian provinces. Between 1091 and 1102, the Kingdom of Hungary conquered the Croatian kingdom. In these circumstances, the Venetians appealed to the Byzantine emperor for recognition of their title to Croatia (like Dalmatia a former Byzantine subject). Perhaps as early as the reign of Vital Falier (d. 1095), certainly by that of Vital Michiel (d. 1102), the title dux Croatiae had been added, giving the full dogal title four parts: dux Venetiae atque Dalmatiae sive Chroaciae et imperialis prothosevastos, Duke of Venice, Dalmatia and Croatia and Imperial Protosebastos. In the fourteenth century, the doges periodically objected to the use of Dalmatia and Croatia in the Hungarian king's titulature, regardless of their own territorial rights or claims. Later medieval chronicles mistakenly attributed the acquisition of the Croatian title to Doge Ordelaf Falier (d. 1117). According to the Venetiarum Historia, written around 1350, Doge Domenico Morosini added atque Ystrie dominator ("and lord of Istria") to his title after forcing Pula on Istria to submit in 1150. Only one charter, however, actually uses a title similar to this: et totius Ystrie inclito dominatori (1153). The next major change in the dogal title came with the Fourth Crusade, which conquered the Byzantine Empire (1204). The Byzantine honorific protosebastos had by this time been dropped and was replaced by a reference to Venice's allotment in the partitioning of the Byzantine Empire. The new full title was "By the grace of God glorious duke of the Venices, Dalmatia and Croatia and lord of a fourth part and a half [three eighths] of the whole Empire of Romania" (Dei gratia gloriosus Venetiarum, Dalmatiae atque Chroatiae dux, ac dominus [or dominator] quartae partis et dimidie totius imperii Romaniae). The Greek chronicler George Akropolites uses the term despotes to translate dominus, lord. Akropolites attributes the title to Enrico Dandolo, although no known document of his survives with this title. The earliest documents using the title attach it to Marino Zeno, leader of the Venetians in Constantinople. The title was only subsequently adopted by Doge Pietro Ziani in 1205. By the Treaty of Zadar of 1358, Venice renounced its claims to Dalmatia and removed Dalmatia and Croatia from the doge's title. The resulting title was Dei gratia dux Veneciarum et cetera, By the grace of God duke of Venetia and the rest. This was the title used in official documents until the end of the republic. Even when the body of such documents was written in Italian, the title and dating clause were in Latin. The doge's prerogatives were not defined with precision. While the position was entrusted to members of the inner circle of powerful Venetian families, after several doges had associated a son with themselves in the ducal office, this tendency toward a hereditary monarchy was checked by a law that decreed that no doge had the right to associate any member of his family with himself in his office, nor to name his successor. After 1172 the election of the doge was entrusted to a committee of forty, who were chosen by four men selected from the Great Council of Venice, which was itself nominated annually by twelve persons. After a deadlocked tie at the election of 1229, the number of electors was increased from forty to forty-one. New regulations for the elections of the doge introduced in 1268 remained in force until the end of the republic in 1797. Their intention was to minimize the influence of individual great families, and this was effected by a complex electoral machinery. Thirty members of the Great Council, chosen by lot, were reduced by lot to nine; the nine chose forty and the forty were reduced by lot to twelve, who chose twenty-five. The twenty-five were reduced by lot to nine, and the nine elected forty-five. These forty-five were once more reduced by lot to eleven, and the eleven finally chose the forty-one who elected the doge. Election required at least twenty-five votes out of forty-one, nine votes out of eleven or twelve, or seven votes out of nine electors. A detailed description of this process, and the ceremonial procession that followed, is preserved in Martin Da Canale's work Les Estoires de Venise (English translation by Laura K. Morreale, Padua 2009). In a ceremonial formula for consulting the Venetians, when a new doge was chosen, before he took the oath of investiture, he was presented to the people with the formula: "This is your doge, if it please you." This practice came to an end in 1423, after the election of Francesco Foscari. He was presented with the unconditional words "Your doge". While doges had great temporal power at first, after 1268, the doge was constantly under strict surveillance: he had to wait for other officials to be present before opening dispatches from foreign powers; he was not allowed to possess any property in a foreign land. The doges normally ruled for life (although a few were forcibly removed from office). After a doge's death, a commission of inquisitori passed judgment upon his acts, and his estate was liable to be fined for any discovered malfeasance. The official income of the doge was never large, and from early times holders of the office remained engaged in trading ventures. These ventures kept them in touch with the requirements of the grandi. From 7 July 1268, during a vacancy in the office of doge, the state was headed ex officio, with the style vicedoge, by the senior consigliere ducale (ducal counsellor). Gold coin of Bartolomeo Gradenigo (1260–1342): the Doge kneeling before St. Mark. 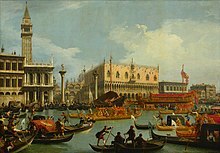 One of the ceremonial duties of the doge was to celebrate the symbolic marriage of Venice with the sea. This was done by casting a ring from the state barge, the Bucentaur, into the Adriatic. In its earlier form this ceremony was instituted to commemorate the conquest of Dalmatia by Doge Pietro II Orseolo in 1000, and was celebrated on Ascension Day. It took its later and more magnificent form after the visit to Venice in 1177 of Pope Alexander III and the Holy Roman Emperor Frederick I. On state occasions the Doge was surrounded by an increasing amount of ceremony, and in international relations he had the status of a sovereign prince. The doge took part in ducal processions, which started in the Piazza San Marco. The doge would appear in the center of the procession, preceded by civil servants ranked in ascending order of prestige and followed by noble magistrates ranked in descending order of status. Francesco Sansovino described such a procession in minute detail in 1581. He description is confirmed and complemented by Cesare Vecellio's 1586 painting of a ducal procession in the Piazza San Marco. From the 14th century onward, the ceremonial crown and well-known symbol of the doge of Venice was called corno ducale, a unique ducal hat. It was a stiff horn-like bonnet, which was made of gemmed brocade or cloth-of-gold and worn over the camauro. This was a fine linen cap with a structured peak reminiscent of the Phrygian cap, a classical symbol of liberty. This ceremonial cap may have been based on the white crown of Upper Egypt. Every Easter Monday the doge headed a procession from San Marco to the convent of San Zaccaria, where the abbess presented him a new camauro crafted by the nuns. The Doge's official costume also included golden robes, slippers and a sceptre for ceremonial duties. Until the 15th century, the funeral service for a deceased doge would normally be held at St Mark's Basilica, where some early holders of this office are also buried. After the 15th century, however, the funerals of all later doges were held at the Basilica di San Giovanni e Paolo. Twenty-five doges are buried there. As the oligarchical element in the constitution developed, the more important functions of the ducal office were assigned to other officials, or to administrative boards. The doge's role became a mostly representative position. The last doge was Ludovico Manin, who abdicated in 1797, when Venice passed under the power of Napoleon's France following his conquest of the city. While Venice would shortly declare itself again as a republic, attempting to resist annexation by Austria, it would never revive the dogal style. It used various titles, including dictator, and collective heads of state to govern the jurisdiction, including a triumvirate. ^ "doge". Dictionary.com Unabridged. Random House. Retrieved 9 July 2018. ^ Donald M. Nicol, Byzantium and Venice: A Study in Diplomatic and Cultural Relations (Cambridge University Press, 1988), pp. 10–12. ^ J. B. Bury, A History of the Eastern Roman Empire from the Fall of Irene to the Accession of Basil I (A.D. 802–867) (Macmillan, 1912), p. 327. ^ Nicol, Byzantium and Venice, p. 24. ^ Agostino Pertusi, "L'Impero bizantino e l'evolvere dei suoi interessi nell'alto Adriatico", in Le origini di Venezia (Florence: Sansoni, 1964), pp. 57–93, at 75–76. ^ a b Şerban Marin, "Dominus quartae partis et dimidiae totius imperii Romaniae: The Fourth Crusade and the Dogal Title in the Venetian Chronicles' Representation", Quaderni della Casa Romena di Venezia 3 (2004), pp. 119–50. ^ Yves Rénouard, Les Villes d'Italie, de la fin du xe sìècle au début du XIVe siècle, Vol. 1 (Société d'édition d'enseignement supérieur, 1969), p. 88. ^ a b William Carew Hazlitt, The Venetian Republic: Its Rise, Its Growth, and Its Fall, 421–1797, Vol. 2 (A. and C. Black, 1900), p. 416. ^ Thomas F. Madden, Enrico Dandolo and the Rise of Venice (Johns Hopkins University Press, 2003), p. 5. ^ J. V. A. Fine, When Ethnicity Did Not Matter in the Balkans: A Study of Identity in Pre-Nationalist Croatia, Dalmatia, and Slavonia in the Medieval and Early-Modern Periods (Ann Arbor: University of Michigan Press, 2006), p. 40. ^ Horatio F. Brown, "The Venetians and the Venetian Quarter in Constantinople to the Close of the Twelfth Century", The Journal of Hellenic Studies 40, 1 (1920), p. 70. ^ a b Thomas F. Madden, "The Chrysobull of Alexius I Comnenus to the Venetians: The Date and the Debate", Journal of Medieval History 28 (2002), pp. 23–41. ^ Maurizio Viroli, As If God Existed: Religion and Liberty in the History of Italy (Princeton University Press, 2012), p. 31. ^ Fine, When Ethnicity Did Not Matter, p. 112. ^ Suzanne Mariko Miller, Venice in the East Adriatic: Experiences and Experiments in Colonial Rule in Dalmatia and Istria (c. 1150–1358), PhD diss. (Stanford University, 2007), p. 129. ^ Vittorio Lazzarini, "I titoli dei Dogi de Venezia", Nuovo archivio veneto, Ser. NS 5 (1903), pp. 271–313. ^ Miller, Venice in the East Adriatic, p. 139. ^ Colin Macfarquhar and George Gleig, eds., "Ducal", Encyclopædia Britannica, 3rd ed., vol. 6, part 1 (Edinburg, 1797), p. 164. One or more of the preceding sentences incorporates text from a publication now in the public domain: Chisholm, Hugh, ed. (1911). "Doge" . Encyclopædia Britannica. 8 (11th ed.). Cambridge University Press. pp. 379–380. ^ Miranda Mowbray and Dieter Gollmann. "Electing the Doge of Venice: Analysis of a 13th Century Protocol". Retrieved 12 July 2007. ^ Sharpe, Samuel (1863). Egyptian Mythology and Egyptian Christianity, with their modern influence on the opinions of modern Christendom. London: J.R. Smith. pp. xi. ISBN 9781497873087. A dramatic account of the ceremonies and procedures that accompanied the election of a doge is to be found in the Estoires de Venise of Martino da Canal (an English translation was published by Laura K. Morreale, Padua, UniPress 2009). Wikimedia Commons has media related to Portraits of doges. Wikimedia Commons has media related to Coats of Arms of Doges of Venice.